CITY legal firm Clarke Wilmott has hired the first apprentice ever to be based at its Cardiff office in line with a call from Wales’ leading training provider for businesses to ‘think apprentice’ in 2017. Chris Matthews, 18, joins Clarke Wilmott’s administration team as the first candidate to be recruited as an apprentice into the national firm’s Cardiff office, which provides a broad spectrum of legal services for both individuals and business clients. Chris, from Whitchurch, fulfilled plans to access the world of work shortly after completing his A Level studies when Clarke Wilmott staff based in Wales’ capital city decided to break with tradition and hire an apprentice in partnership with ACT Training. Chris is studying for a Business Administration Level 2 qualification with Clarke Wilmott after the company contacted ACT Training for assistance in finding the ideal candidate. As Wales’ leading training provider, ACT Training has in turn been challenging local businesses Wales-wide to ‘think apprentice’ in 2017 and pledging in return to find them the perfect recruit in time for National Apprenticeship Week. Running from March 6-10, National Apprenticeship Week 2017 brings together employers and apprentices from across England and Wales to celebrate the positive impact apprenticeships and traineeships continue to have on individuals, businesses and the wider economy. 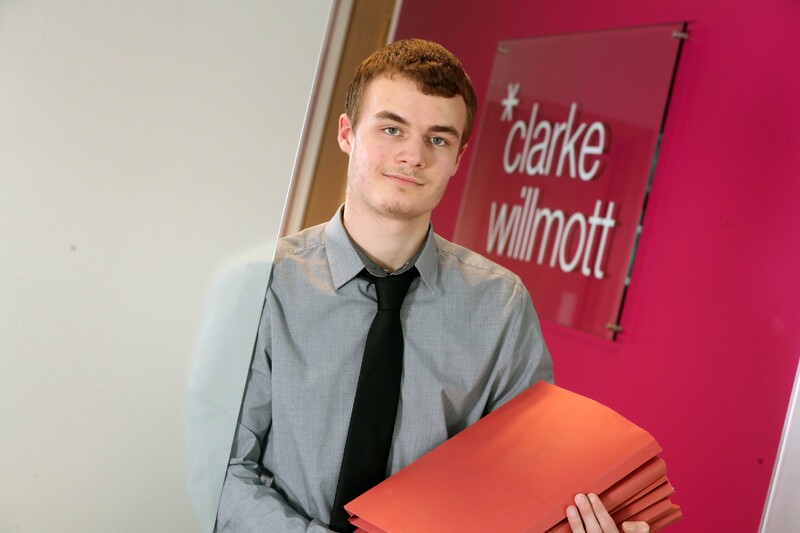 In Clarke Wilmott’s case, the company opted to start the year by advertising for an apprenticeship vacancy to be based at its Cardiff branch – a decision which has so far proved to be very positive indeed. Grace Larbey, Human Resources Advisor at Clarke Wilmott, said: “It can be really difficult to know what you want to do when you haven’t yet experienced the reality of a daily working environment, and I think it’s really important as a business to support young people in carving out the right path of progression that is best suited to them as an individual. Established more than 28 years ago, ACT Training has centres in Aberdare, Barry, Blackwood, Bridgend, Caerphilly, Cardiff, Newport and Swansea and currently works with over 700 employers including British Gas, NatWest, Barclays, NHS Health Boards, Radisson Blu, Admiral and many more to place trainees in a wide variety of work-based roles. As Wales’ leading training provider, the organisation decided to mark National Apprenticeship Week 2017 by calling on businesses in all sectors to come forward and discover more about the benefits apprenticeships can bring to both the business and individual involved as part of their very own ‘Apprenticeship Challenge’. Andrew Cooksley, Managing Director at ACT Training, said: “The placement of Chris into a work environment he had long desired to experience, but had perhaps previously been unaware of as a viable route for progression or indeed as an option available locally, is exactly why the ACT Apprenticeship Challenge was devised.